This entry was posted in awareness, change, empowerment, gratitude, wisdom on 16 August 2016 by Martina. Back to the shower for this week’s inspiration (I just love how the water amplifies everything for me and makes the flow so much easier). I had a whole list of things to feel grateful for, and yet, it somehow wasn’t coming forth. It felt restrained, which meant it was time to step back and listen as I lathered up my hair with a new shampoo. I suddenly felt a charge running through me that surpassed anything I had felt previously. It was like gratitude on steroids. And I continued with my list. 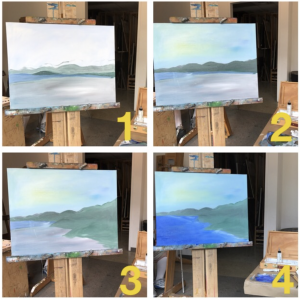 Once I finished I took a deep breath and reflected on what had just happened. “Thank you…” is an ACT of gratitude; while “I’m grateful for…” is a STATEMENT of gratitude. 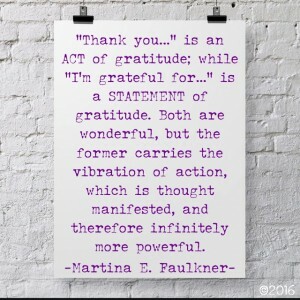 Both are wonderful expressions of gratitude, but the former carries with it the vibration of action, which is thought manifested, and therefore infinitely more powerful. Very cool. When something is passive for me, I tend to dabble with my toes in the water. When something is active for me, I tend to dive in and swim. Shifting my gratitude from a statement to an act made it palpable, tangible and accessible – and it imbued me with a sense of empowered appreciation that I hadn’t felt previously. In other words, it changed everything. The shift was immediate, deep, and carried over into all of my days since. Being in gratitude is the easiest and fastest way I know to stay in the flow of life and to stay present. Practicing gratitude as action instead of statement, makes it even easier. This entry was posted in awareness, change, choice, empowerment, gratitude, wisdom on 2 August 2016 by Martina. How many of us struggle with feeling “good enough” or staying motivated to keep going when we face a seemingly long array of obstacles? I know I’m not alone when I share this thought. Not only have I seen it in my clients and colleagues, but I’ve also witnessed it in my personal life among friends and family. It’s that feeling of looking forward to the next rung on the ladder, and finding the motivation within to keep going, keep striving, keep climbing, as we look ahead at those who have already “done it” – whatever “it” is. They’ve had a LOT of help to get where they are. So, first, let me say that I have had wonderful help with my first book and its subsequent tour, as well as various other projects I’ve created. Additionally, I know I’m successful in what I do and have done, which I am especially reminded of when I receive unexpected messages of gratitude for my work. (Thank you, again, by the way, I love hearing from you!) 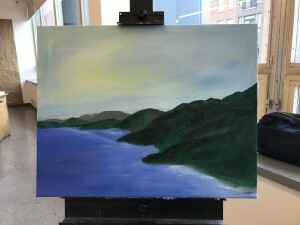 My challenge has been in making it scalable, which is a new focus for me this fall. But what I’m talking about goes deeper. It’s more than that. 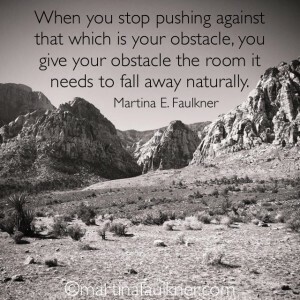 When someone has a fire burning in their belly to walk the path they’ve been given, it can sometimes be frustrating when the path seems slow or strewn with obstacles. Part of the reason for that is because we are always looking ahead. Guilty as charged. As a Visionary, it’s my job to constantly be flying between the forest and the trees, to understand the ever-changing perspective and digest it in a meaningful way. As a Writer and Coach, it’s my job to then relate that information in an accessible and actionable manner. This is my path, and I love and accept it. It means that I am always looking around, assessing and monitoring the universal energies and shifts I see to understand what they mean for humanity, from both a divine and human perspective. As I’ve said before, I write from my soul to understand my humanity. 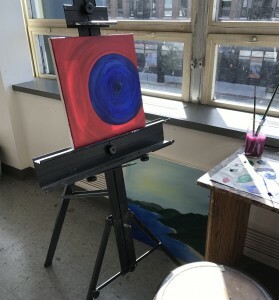 It’s from this space that I then help people to (re)connect and understand their souls (and their humanity) better. It’s cool work, and I love it. looking at the others who have done it… and the cycle continues. Until, one day, at 39,000 feet in the air, I was given the key to breaking the cycle. Last week I spent 38 hours trying to get home. I was in Virginia flying with my family back to the Midwest, and everything was canceled or delayed. Everything. We handled it rather graciously I think, as we never lost our humor or kindness throughout the ordeal. In the end, it would have been faster to drive, but there were a lot of logistical issues, so we stayed the course and finally made it home about 26 hours after our original ETA. On the final flight home my humor was beginning to wane, so I chose to meditate a bit. I put on some good music, plugged myself into my headphones, and started to breathe. Previously, I have mentioned that showers have been one of the easiest places I have ever found in which to receive clear messages from Spirit. Well, it turns out that 39,000 feet, surrounded by strangers, inside a metal tube was surprisingly easy too. As I breathed, I felt myself drop into a deeply relaxed state, and then the images and visions started coming, followed by the words. 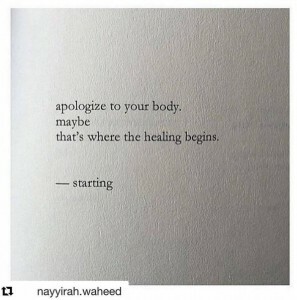 There was a lot of information for me (I hadn’t actively “connected” in almost 2 weeks – yikes), and I allowed myself to be present to it all, knowing I wouldn’t “remember” it all but that I would ingest it all. One thing stood out, however, and I burned it into my mind’s eye, because of its simplicity and power. In that moment, I was meditating on the future (asking questions and receiving guidance on how to move forward), and I started to feel a wee bit overwhelmed in my breath. Then I heard those words. In my vision, I energetically turned around from where I was standing and saw my wake behind me. It trailed off into infinity like a peacock tail of golden white stardust. It was breathtaking. Humbling. And then my heart filled with gratitude, awe, and love, and any sense of frustration or overwhelm dissipated immediately. You see, many of us spend so much time striving ahead that we forget to pause, look behind us, and honor what we’ve already done. The lives we’ve touched. 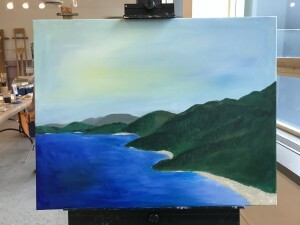 The art we’ve created. The joy we’ve given. The love we’ve shared. It’s all there. Every last instance of that which we’ve created is in our wake. Some of it we know about and a lot of it we don’t. Looking at our wake is the key to breaking the cycle of frustration and overwhelm when we are feeling ‘lesser than’ or unmotivated. Looking at our wake keeps us grounded in who we are, what we’re doing, and why. 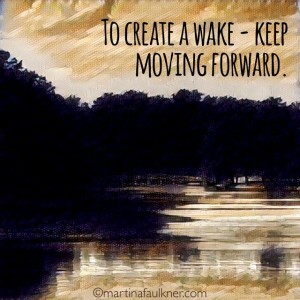 To make ripples of change – to create a wake – keep moving forward. 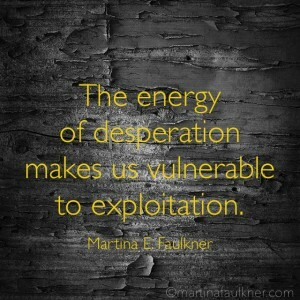 It’s true, and especially helpful when we are feeling stuck, discouraged or overwhelmed. If we wish to create positive change in the world, or in our lives, it’s not about the milestones – it’s about the movement between the milestones. The milestones allow us to pause and look back at our wake and smile, which then recharges us for what lies ahead on our journeys. This entry was posted in 365, Author, book, grace, gratitude, guidance, inspiration, journey, joy, spirituality, story, wisdom on 21 June 2016 by Martina. I am so excited to share this news with you. 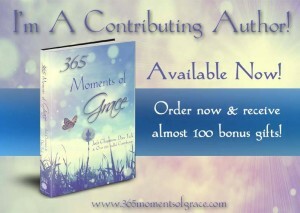 365 Moments of Grace is out TODAY and I’m a Contributing Author! In its pages, I have shared my personal story of Grace – how I found it, what it means to me, and how it’s ever-present in my life…even when I forget. Like last week. As such, I’m so happy to share this book with you! As a contributing author, you’ll see that this is a collaborative work, and I think it’s ingenious. 365 Moments of Grace is a daily devotional created around a central idea (grace) with over 250 authors sharing their stories and wisdom. Most devotionals have a theme and a single voice, which sometimes can feel repetitive. In our book, each voice is unique, which gives a much broader perspective to the topic. Awesome! If you’d like to support us in reaching our “bestselling” status, and more importantly, to add a wonderful inspirational book to your bookshelf, please buy your copy today, by using this link. This link is personal to me, and will actually support me as one of the authors (albeit a teeny-tiny percentage), which would be additionally awesome, and greatly appreciated. Feel free to share it with your friends and family too. Of course, you can purchase the book at any time, and an e-book should be coming out in a couple of months, too. As always, I appreciate your support, thoughtfulness, and encouragement on this journey of mine, as I keep writing and helping others through theirs. P.S. There are over 100 (!) Bonus Gifts available from various authors when you purchase the book, including my very own hand-drawn mandala on Grace. Check them out, here.